"IF IN DOUBT … TAKE IT!" That’s the advice in a slideshow presented to New Jersey prosecutors pursuing civil asset forfeiture cases, an obscure process which allows the government to take citizens’ property even if they have not been convicted or charged with a crime. In other training sessions and lectures across country, law enforcement officials spoke frankly about targeting expensive cars and flat-screen TVs, mocked the Spanish accents of people whose property had been taken, and described a well-crafted forfeiture complaint as a "masterpiece of deception." Harry Connelly, the city attorney of Las Cruces, N.M., called such property "little goodies" in a Santa Fe training session. 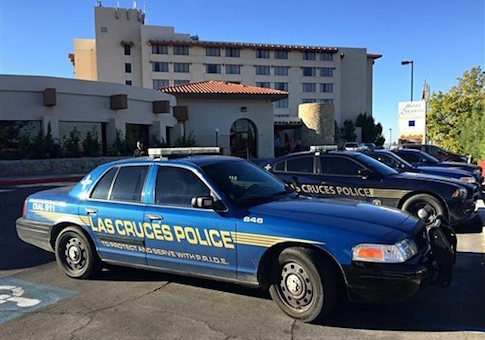 New Mexico is one of several states around the country that has expanded its asset forfeiture program to include prostitution stings and drunk driving busts. "A guy drives up in a 2008 Mercedes, brand new," Connelly said. "Just so beautiful, I mean, the cops were undercover and they were just like ‘Ahhhh.’ And he gets out and he’s just reeking of alcohol. And it’s like, ‘Oh, my goodness, we can hardly wait.’"
Videos and slideshows from the sessions were flagged by the Institute for Justice, a public-interest law firm, and first reported by the New York Times on Monday. The Institute for Justice has several open lawsuits challenging asset forfeiture practices. As reported by the Washington Free Beacon, the law firm is suing to shut down Philadelphia’s asset forfeiture program, one of the most prolific and aggressive in the country. Asset forfeiture is intended to disrupt organized criminal activity, especially drug trafficking. However, critics say perverse incentives and a lack of safeguards lead just as often to ordinary citizens—some of whom haven’t even been charged with a crime, much less convicted—having their property seized, after which they must go through an arduous and costly process to retrieve it. The Institute for Justice says the videos confirm many of its biggest criticisms of the program. "Americans ought to be outraged to know that behind closed doors, the people they’ve entrusted to uphold the law have little respect for constitutional rights," Institute for Justice attorney Scott Bullock said in a statement. "The officials’ utter disdain for the sanctity of private property shown in these videos makes it clear that the profit incentive inherent in civil forfeiture perverts law enforcement decision-making and deprives citizens of their right to due process." Gary Bergman, a prosecutor with the Prosecuting Attorneys’ Council of Georgia, said in one of the videos that civil forfeiture has been unfairly represented in news reports. "All they hear is the woman was left on the side of the road and the police drove off with her car and her money, no connection to drugs," Bergman told other prosecutors at the session. "I’m not saying that that doesn’t happen—it does. It should not. But they never hear about all the people that get stopped with the drugs in their cars, in their houses, the manufacturing operations we see, all the useful things we do with the money, the equipment, vehicles." Last year, the Atlanta Journal-Constitution reported that Georgia officials used asset forfeiture funds to pay for tickets to a basketball game, an office holiday party, a home security system for a District Attorney, and a $90,000 sports car. In official statements, police officials often stress that seizures aren’t contingent on department desires or budgets, but in the sessions highlighted by the Institute for Justice, a different picture is presented. Sean McMurtry, the chief of the forfeiture unit in the Mercer County, N.J., prosecutor’s office, said flat screen TVs are "very popular with the police departments … every flat screen, so far, that we’ve taken has been put to use in a police headquarters or in a training room." McMurtry advised police officials to let him know if a particular car caught their eye. "If you want the car, and you really want to put it in your fleet, let me know — I’ll fight for it," McMurtry said. "If you don’t let me know that, I’ll try and resolve it real quick through a settlement and get cash for the car, get the tow fee paid off, get some money for it." Connelly also mused that marijuana decriminalization may have an upshot for law enforcement officials. "I got to thinking this morning, in the paper that everybody is running around liberalizing marijuana or thinking about it," Connelly said. "Putting it on the ballot. Taking it off the ballot. And I thought, boy, what a trap. You liberalize marijuana so somebody can sell it, they sell the marijuana out of the house, then you seize the house, which is like 10 bucks of marijuana and you [the police] get a $300,000 house. What a deal. That’s really exciting. They get what they want, and you get what you want. And the title of that article in the [Wall Street] Journal was ‘What’s Yours Is Theirs.’ I want to turn it around as ‘What’s Theirs is Yours.’"
In one of the most highly publicized asset forfeiture cases, police seized a Philadelphia family’s home after the family’s teenage son was caught selling $40 worth of drugs. McMurtry acknowledged that many of the seized cars weren’t driven by their owners when they were taken by police, effectively punishing a family member for their relative’s crime. "The bulk of the vehicles that we take in are registered to someone other than the defendant," McMurtry said. The Free Beacon observed several such cases firsthand in Philadelphia. However, in the Santa Fe video, a police officer was skeptical of owners who said they weren’t aware of their relative’s criminal activity. "I can’t tell you how many people have come in and said, ‘Oh, my hijito would never do that,’ " the officer said, speaking in a high female voice with a Spanish accent. Connelly also alluded to the income bracket of most people targeted by civil asset forfeiture. "We’re not dealing with the Beemer [BMW] crowd so much," Connelly said. "We deal with just down-to-earth human beings that have their cars seized." "Under our ordinance, we have cornered the 1978 Cadillac motor vehicle part of southern New Mexico," Connelly continued, eliciting chuckles from the audience.